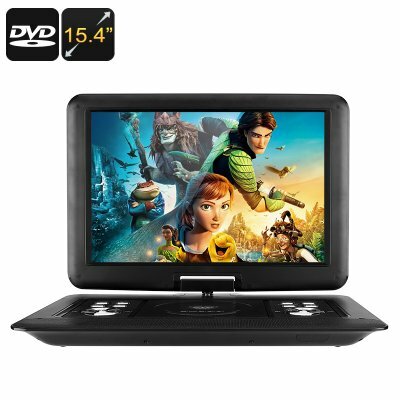 Successfully Added 15.4-Inch Portable EVD / DVD Player - Universal Disc Support, Game Play, FM Radio, E-Book, Analog TV, Screen Rotation to your Shopping Cart. So much more than just a regular portable DVD player – this portable EVD player lets you enjoy the latest 3D movies, analog TV, games, FM radio and a whole lot more no matter where you’re at. Coming with a large 15.4-Inch TFT LED display, this portable DVD player lets you enjoy all your favorite movies, series, games, and more in absolutely stunning beauty. No matter where your next trip will take you, with this EVD / DVD player at your side, you’ll always be able to enjoy a truly cinematic experience at all times. Its state of the art display furthermore comes with a 270-degree rotation feature, allowing you to twist and turn it in any direction imaginable to get the best possible viewing angle – letting you enjoy movies and games even in tight places such as the back of the car. Supporting 3D movie, this portable DVD player certainly brings along a media experience like no other. Coming with a powerful 2000mAh battery, this media system lets you enjoy all your favorite media for multiple hours in a row without needing to worry about battery life. Allowing you to slip in 16GB of external memory through either an SD card or USB stick – this portable DVD player is guaranteed to pack enough space to save all your games, videos, and pictures – assuring that you’ll never have to be bored again. Perfect for entertaining your children during an upcoming holiday abroad, or simply to enjoy a movie at night while out camping – this portable EVD / DVD player lets you bring along your media wherever you go. With region free disc support, it even allows you to add new DVDs to your collection that are purchased abroad because this media player is guaranteed to play any DVD disc out there. It may happen that you get bored of your current DVD selection but fear not, this portable DVD player packs an abundance of other fun features to keep you busy and entertained at any time. Analog TV support, for example, lets you watch regular television at all time – allowing you to watch the news, talk shows, and your favorite series just like at home. A built-in FM radio additionally lets you listen to your favorite tracks, the weather forecast and more. With two 2W speakers, this portable EVD / DVD player is guaranteed to deliver great sound – letting you enjoy an audiophile grade audio experience whenever you turn it on. Besides playing 3D movies and supporting Analog TV and FM radio, this portable media player also supports pictures and 32 bit NES games – the latter of which is guaranteed to bring along countless hours of joy and entertainment. Coming with a large display and easy to operate buttons, this portable DVD player is great for people of any age who like to enjoy movies, games, and more while on the go. Perfect to bring along on your next camping trip as, with this portable media player at your side, you’ll always have the means to stay entertained whilst being forcefully kept inside your tent, caravan, or cottage during a rainy night at the campsite. Added to that, this portable DVD player is guaranteed to keep your kids entertained throughout the road trip towards your next holiday destination, guaranteeing that you’ll never get asked ‘’Are we there yet?’’ again. This portable DVD player comes with a 12 months warranty, brought to you by the leader in electronic devices as well as wholesale electronic gadgets..
Arabic: - 15.4 بوصة المحمولة دي في دي - Chinese Simplified: - 15.4 英寸便携式 dvd 播放机 - Czech: - 15.4coul Nositelný DVD herec - Danish: - 15.4-tomme transportabel DVD spilleren - Dutch: - 15,4-inch draagbare DVD-speler - French: - Lecteur DVD Portable de 15,4 pouces - German: - 15,4-Zoll-Portable DVD-Player - Hebrew: - נגן DVD נייד 15.4 אינץ - Hindi: - 15.4-इंच पोर्टेबल डीवीडी प्लेयर - Italian: - Lettore DVD portatile 15,4 pollici - Japanese: - 15.4 インチ ポータブル DVD プレーヤー - Korean: - 15.4 인치 휴대용 DVD 플레이어 - Malay: - Pemain DVD mudah alih 15.4-inci - Norwegian Bokmål: - 15,4-tommers bærbar DVD-spiller - Romanian: - 15.4-inch Portable DVD joc - Russian: - 15,4 дюймовый портативный DVD-плеер - Spanish: - Reproductor de DVD portátil de 15,4 pulgadas - Thai: - 15.4 นิ้วเครื่องเล่น DVD แบบพกพา - Turkish: - 15.4-inç taşınabilir DVD oyuncu - Vietnamese: - 15.4-inch Portable DVD Player.